The Class I By-pass separator provides a high level of hydrocarbon removal at normal flow rates while higher flow rates bypass the main chamber thus preventing contamination of the increased flow. This Separator is generally recommended for use in low risk areas such as car parks where there is a risk of frequent oil contamination of surface water. 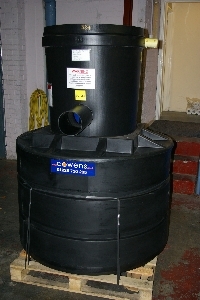 As part of the Environment Agencies Pollution Prevention Guidelines PPG3 and current British and European Standards BSEN858, Bypass Oil & Silt Separators have become a necessity on most car parking and light road schemes and are equally important as up stream defence for storm water storage systems. By-pass separators are designed to treat over 99% of all rainfall events in the U.K. and Europe. All separators must now be tested and approved to the European Standard and feature on the Environment Agencies separator provider report. They must prove under test that they separate and retain any hydrocarbon in rainwater flows up to 6.5mm per hour. Rainfall above this is extremely rare even in recent flood conditions in the U.K. The given application for Bypass separators in PPG3 is for use in areas where there is low risk of oil (hydrocarbons) polluting an area ie car parks, small road schemes and lightly contaminated hard standing areas. design, which would be easy and extremely cost effective to install. Performance tested by one of Europe’s leading independent test houses, it was the first polyethylene By-pass Separator to be approved for use in the UK and Europe under the new standard. The Geoceptor range achieved exceptional performance results, in some cases untraceable levels of hydrocarbon after very high levels of diesel enter the unit under test. Even the test house was amazed that we could get such good results from such a small compact design. The existing By-pass separator designs in the industry were very antiquated, many having been around for over 30 years. Firstly its extremely compact and very robust hdpe body is much smaller than any other bypass models available. Its vertical design adds strength as well as having proven silt settlement values. Its strong shape mean less backfill is required than most GRP tanks available, making it very economical to install. It is ideal for storage on site or merchants yard being lightweight and easy to handle as well as extremely robust, unlike GRP models which are larger, heavier and prone to damage. However the key to its performance is its patented filter system. This is the main operational part of any class 1 separator. The patented filter system is in a protective housing in the top of the unit. Silt, emulsions and grease that enter the top chamber and are then skimmed into the bottom retention chamber in suspension, where they are trapped and retained until emptied. The filter cassette is located and sealed into the housing and being right at the very top it can be accessed easily and removed within seconds. With other designs, the filter is unprotected at the bottom of the separators retention chamber where silt and grime quickly gather around the unit and stop it performing efficiently. Another major problem with the location being at the base of the retention chamber is that it make’s it impossible to remove the filter without emptying the whole separator , which is a huge maintenance cost, where here the filter simply lifts out in seconds without emptying and it only weighing 4 kilos. Testing and Accreditation. With drainage capabilities up to 10,000 sq m have now been fully tested to EN858-1 and this is the first Polyethylene Separator to be approved for use on the Environment Agencies Separator Providers Report. The testing proved that this design would remove hydro carbon to a level that could not be traced.